Every crab is out for themselves, with no care about the others who are also trying to survive. Instead of helping each other in King of Crabs, your goal is to simply eat enough to outlive the others, unless you want to start fighting! 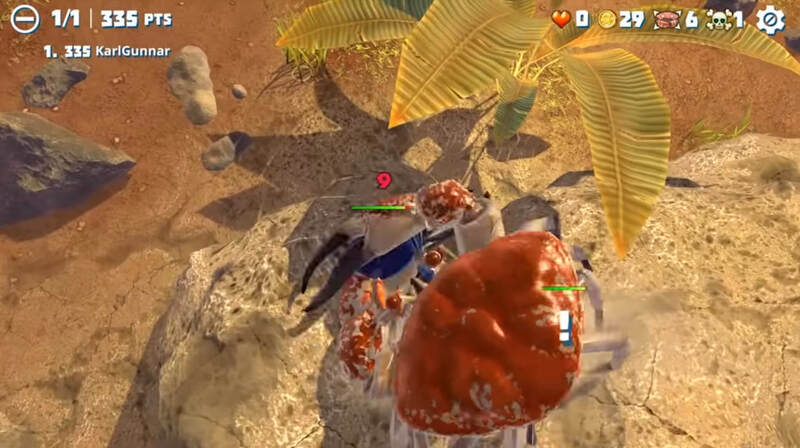 King of Crabs is a multiplayer mobile game which gives you the chance to play as a crab moving quickly across a bunch of little islands or a beach. This crab, much like all of the other crabs, have one goal in mind: survival. You’ll need to eat to survive, there is plenty of sea life, animals, and even fruit all over the island to eat, but sometimes you might find the other players are very hostile. With two different play styles, one more focused on survival and the other focused on being the best of the group, you get to decide what kind of crab you want to be. Personally, I wanted to be the biggest, best crab on the island, killing all of the tiny, worthless crabs that might try to take my food. With that focus in mind, you can move around the island, boosting to move faster if your blue bar is full, grabbing up whenever food you can find. Food will make your crab increase in size, increasing it’s health and boost time for that game. Food is also essential. As you move around, your health will drop if you aren’t eating. The bigger the crab is, the more often it needs to eat, meaning that larger crabs will struggle to stay alive without a constant food source, forcing them to sometimes play more aggressively. Aggressive crabs kill off smaller crabs ending the game for some players. Dotted around the island are crates that can be broken, yielding a selection of weapons and shields for your crab to grab. It might be a giant sausage you hit people with, or maybe a sword, or a razor clam shell, all with a limited use to help you bash each other! Shields come in the form of shells, bits of garbage, or even Captain America’s discarded shield if you get lucky. When you do end up dying, you can revive yourself for a few hearts, depending on your size, but eventually you will end up at the main menu. There, your points that you’ve earned, or rankings if you are playing the rank mode, will unlock points and skills. You can use these skills on specific crabs you have unlocked, to make them have more health, speed, or strength. 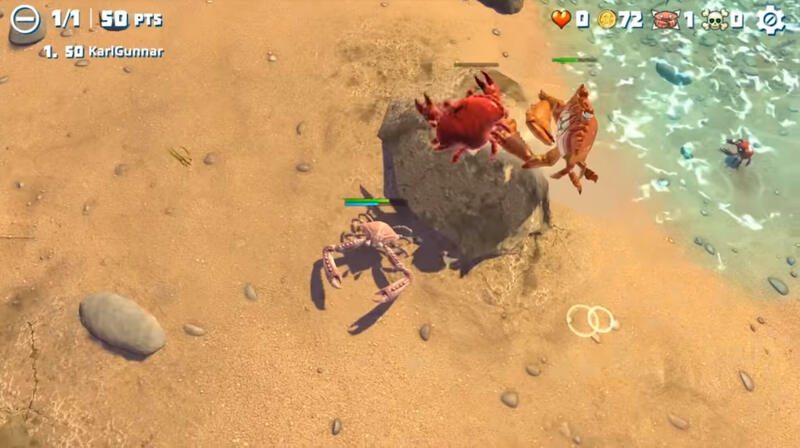 You can also add points to a special skills area, which can give your crab a great advantage when spawning in as a small crab. 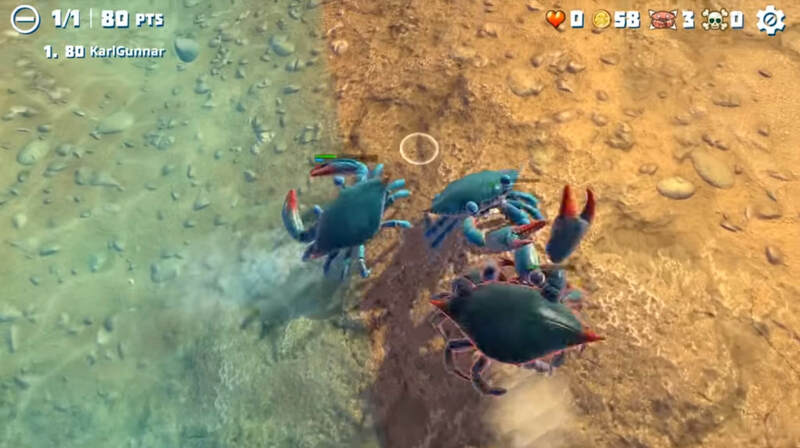 For coins, which you can either purchase or earn in the game, you can unlock more crabs. Each specific crab can be leveled up with use and by points — these crabs aren’t skins and their levels do not go across them all. They have different perks to them, depending on how you play. Speaking of skins, you can end up purchasing hats and various costumes for your crabs, which look pretty cool especially when you’ve got a weapon in hand. In my time in King of Crabs I have both killed and been killed, a lot. Going back and leveling up your crab is really essential if you want to have a chance in the ranked mode. It’s probably a good idea to start off just trying to survive until you have gained enough points to not just die quickly in ranked. When you do go face others the best strategy I found was to avoid any crabs on the mini-map until you are a big enough size to risk taking them on. Everyone is cutthroat in ranked mode, wanting to make sure that the competition is eliminated early on. The controls, for someone who doesn’t game so much on mobile, does take a bit of getting used too, but once I was into the game I found I could deal with it. Occasionally, like in any multiplayer, I found myself hating the people I played with — killing me instantly on spawn in and eating my flesh. There aren’t too many ads within King of Crabs either, they only popped up after I died in a bunch of rounds, almost to remind me to take a breath before diving back in. All and all, King of Crabs is a pretty fun, and silly, game. Walking around with a meat fork and a turtle shell, I was able to kill a spider crab and eat it’s flesh, right before a crab with a hermit shell and a jester hat killed me from behind. You can play King of Crabs on your Android or iOS device.